Mac Enright has been framed for a murder he didn’t commit, and is about to be executed. He has no use for the clergyman visiting him, as he has no intention of confessing when he’s an innocent man. The clergyman, however, has come to help him escape. It seems that the man whose false testimony convicted him , Mr. Davidson, is feeling guilty, and has paid some bribes so Mac can get away. After he is free, instead of leaving the country as he’s advised to do, Mac decides to track down Mr. Davidson to find out the whole story, and to clear his name. Meanwhile, Sabrina Davidson, (the daughter of Mr. Davidson) has just received some news that has devastated her. A notorious widow tells her that she will be marrying Sabrina’s widowed father, and that she has full intentions of running the household. Sabrina is now twenty nine years old, and has never married. She nursed her sick mother, and then ran her father’s household for years. The thought that she will now be treated as nothing more than a poor relation grates on her. She escapes to her sanctuary, a little hut, to be alone and dwell on her situation. She finds that the hut is inhabited by Mac, who has taken very ill, and sought shelter there. She manages to rouse him enough so that he is able to get back to the house with her help. Once they get there, Sabrina calls to her father for help only to find that he has disappeared. She gets Mac settled, and begins to take care of him. Because of her fragile state of mind, she begins to think of all she has missed in her life, how she’s never known a man’s love. She impulsively kisses sleeping Mac, who wakes up, and returns her kisses, and then the encounter turns passionate. Now lovers, although virtual strangers, Mac and Sabrina are both willing to see where their relationship leads. I adored Mac right from the get-go. Even when he was facing death, he was courageous and strong. His treatment of Sabrina was honorable and caring. He realized that their affair may have consequences, and didn’t run away from them. He also didn’t let the fact that Sabrina’s father was the man who almost cost him his life color his feelings and treatment of her. True hero material! At first, I found Sabrina to be a bit spoiled and full of herself. When her comfortable world is shaken, her reaction appears somewhat pouty. As she falls in love, and works with Mac to solve the mystery, she matures into a loving and caring woman, and is very likeable. 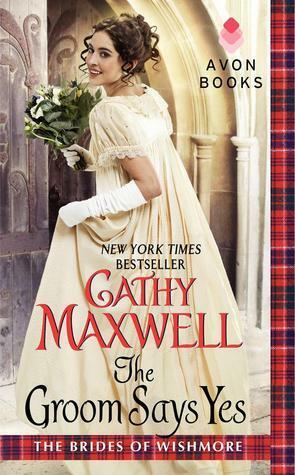 This is my favorite book of the Brides of Wishmore trilogy. (It can be read as a standalone.) The romance and mystery were both well developed, and I cared about the characters. I enjoyed this well written story, and highly recommend it.